HomePage: What a difference just one word can make. But there’s more craftsmanship here so make yourself a coffee and read on. Donation Thank-You Letter: When you’re asking them to do more than they already have, put them into the bigger picture. HomePage: Once more … with feeling. 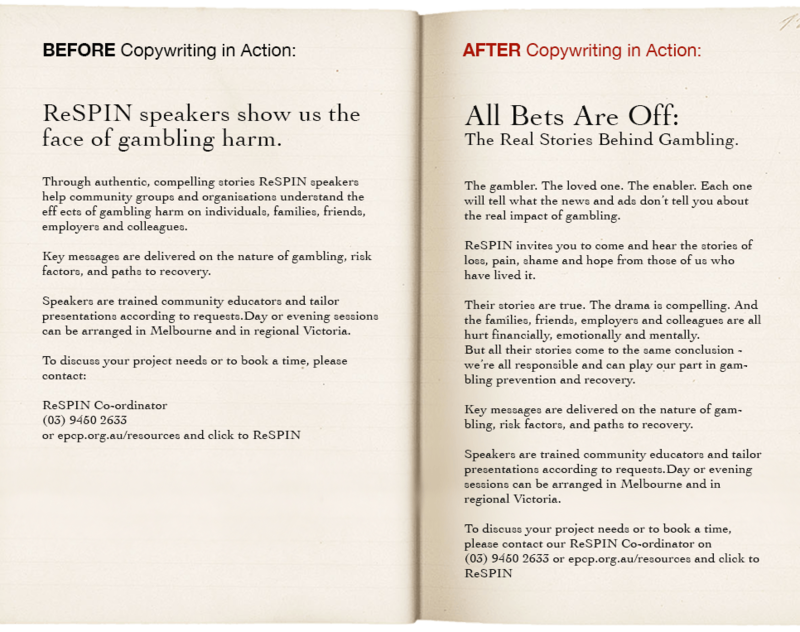 Leaflet: The only way to tell the real stories behind gambling is to write like a real story teller. White Paper: Good Manager Bad Manager is the title of this White Paper and the introduction section sums up clearly what we’ll get. Course Book: Save us the history lecture and abstractions, talk to us as if we were sitting across the table from you. 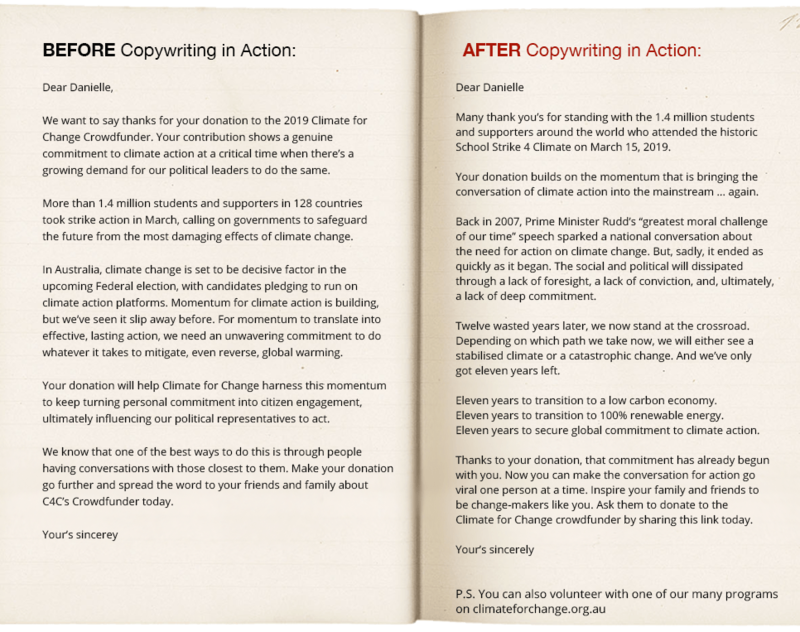 Landing Page: It’s amazing what a difference a good brief makes. And sometimes it’s up to the copywriter to write one. 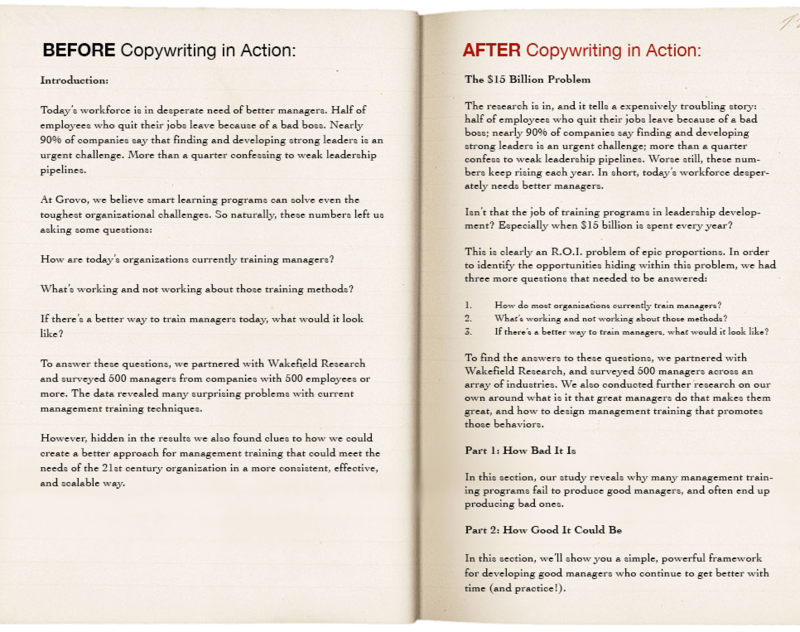 Brochure: Leadership Development company writing their own copy. From feature lecture to benefit-driven dialogue. eDM: Cut to the chase, especially if you’ve got a compelling number. And cut email lengths by half too. Blog Post: Story. Show Don’t Tell. And tell don’t sell. You’re entering someone’s world, be interesting, be respectful, be helpful. 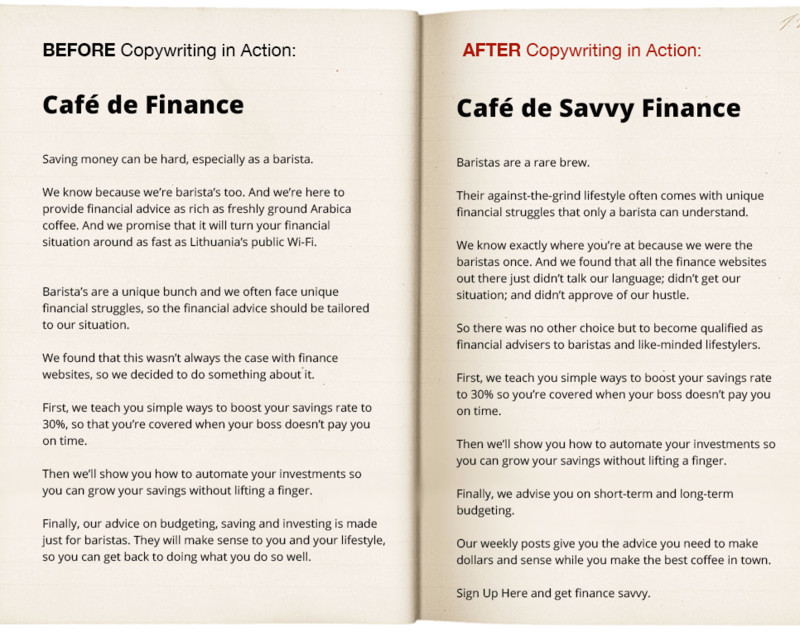 Landing Page: Start-up business writing their own copy. From product point-of-view to prospect-point-of-view. eDM: Email Marketing copywriter loses himself in the copywriting. After CWiA, he finally finds his voice. Print advertisement: a clear case of repetition in the Before draft. A clear case of clear, concise and compelling thinking in the After draft. Print Press Release: missing from the “before” draft was a story. As the writer was made to explain it, what became clear was the story of an unlikely hero. Web Page: rather than skirt around the truth, the writer was asked to tell the honest truth and allow the reader to know up front what is asked of them. Web Page: The “before” draft is a perfect case of The Curse of Knowledge (assuming the reader understands what you understand), when the writer was asked to spell out and unpack the product and proposition, we could finally see what he could see. Brochure: Corporate-speak with a dash of hyperbole transformed into plain English with a demonstration of the proposition – Leadership. 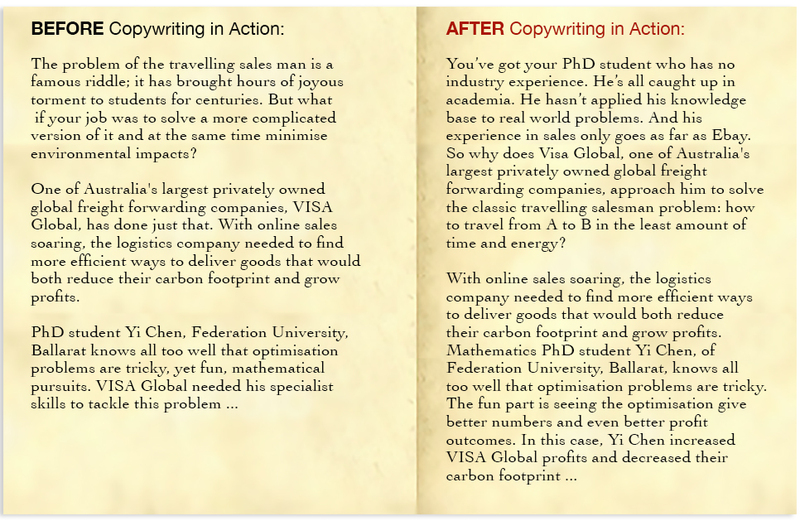 RMIT’s and CAE’s highly regarded Copywriting course by Nicolas Di Tempora is now live online. This ensures a more customised, 101% you-time training program. This means a whole lot more writing time, which is absolutely essential for improving your thinking and writing skills. It all happens live and in real-time via Skype and Google Docs. You will be expected to complete a minimum of two projects. This allows you time and space to practise, practise, practise the critical strategic and creative processes that makes the difference between garden variety writers and accomplished communicators. 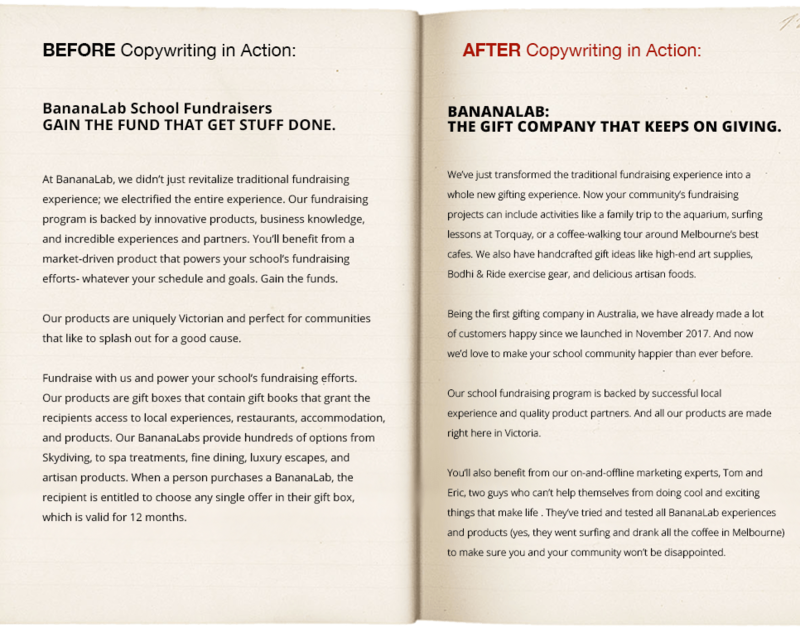 Whether you choose RMIT or my Copywriting in Action Online School, you will be collaborating with professional copywriter [DDB and Saatchis] and qualified teacher [Dip. Ed & RMIT University Media & Communications] yours truly, Nicolas Di Tempora.